Artzy Bitzy: happy birthday - cupcakes! happy birthday - cupcakes panel, a photo by eatzycath on Flickr. The inaugural post on Artzy Bitzy .... and I wanted to share this colorful birthday card made earlier this year for my sis-in-law, LZ. 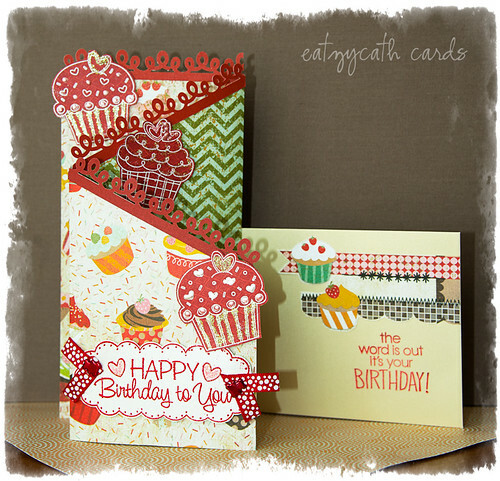 A triple-panel card (a cinch to make when using double-sided patterned paper), with embellishments made using Hero Arts Happy Birthday Cupcakes cling stamps set (stamped on red patterned paper, white embossed - for cupcakes, red embossed - for birthday sentiment and cut), and a complementary stamped greeting on the envelope as well - from the Hero Arts Wish Big clear stamps. Having embarked on scrapbooking and cardmaking for the last year or so, it's been one of my most relaxing and engrossing hobbies to-date. The amount of art/ stamp/ papercraft supplies out there in the world is staggering and mind-boggling! Am I a happy trouper?? You betcha!